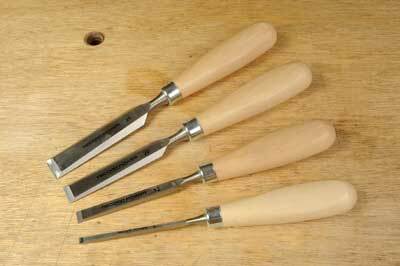 If you go looking for a new set of chisels you could be forgiven for thinking they only come in sets of four or six bevel edge pattern and there are no other options. This isn't correct now, any more than it was in years gone by, but to be able to make the most discerning choice you need to visit a specialist high quality tool dealer in person, or look at manufacturers' and dealers' websites online. 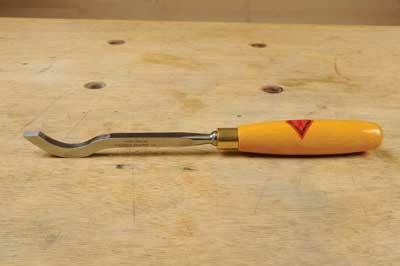 What we can do is show you some of the finer points of these essential hand tools. 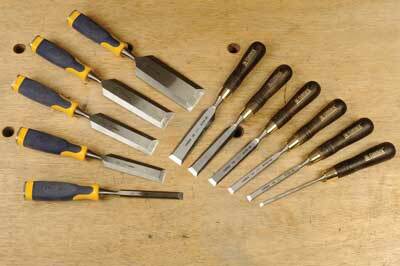 No tool kit can be without chisels but a few more of the better ones can make a real difference to your working methods. 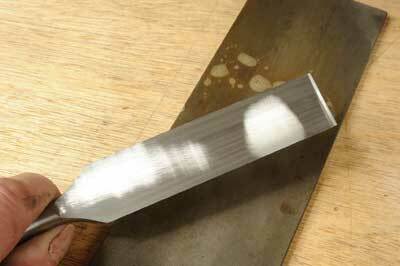 Gouges are also very useful where you need to cut on the curve and there are different types of these also. This is far and away the most common, preferred type and the most widely sold. The low bevel angle to the sides of the blade make it comfortable to hold the blade body and ideal for undercut work such as cleaning out dovetails and mortises choked with wood fibres. Once, such a slender profile might have been regarded as less strong than is ideal but modern steels are extremely tough and when looked at in end profile you can see there is plenty of blade metal for making heavy mallet-driven cuts. The poor old firmer with its square sided profile has lost ground to the bevel type greatly. Hand working techniques have changed quite a lot with the advent of power tools to do most of the 'grunt work'. 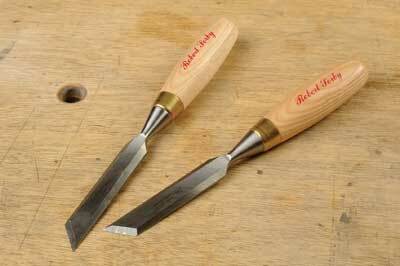 This has meant there isn't much advantage to using firmer chisels for a lot of activity and indeed older quite slender firmer chisels with ash (Fraxinus excelsior) or boxwood (Buxus sempervirens) handles can often be found second hand. More recently Veritas have produced some super expensive chisels with an off-square edge profile which gives strength and will clear a normal dovetail angle. The skew takes a leaf out of the woodturner's book by having an angled tip available in left- and right-hand versions that can be used to cut into tight awkward corners. Not essential but handy sometimes. It is quite easy to cut yourself on these so a little care is needed handling them. 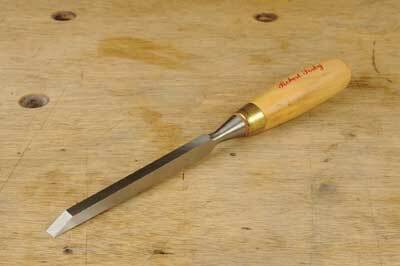 Another newer invention, the corner chisel or 'bruzze' is excellent for predictably square cut corners, especially for mortises. Handy if you use a router or slot mortiser and want square sockets. 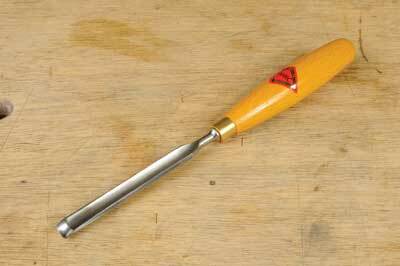 Paring chisels have been around for ages and are very useful for clearing and flatting housing joints which can be quite long and inaccessible to standard shorter chisels. These are really only required if you have a regular need for these, only one may be necessary. This version gets around the problem of both the handle and hands striking the carcass leading edge when paring out a housing, as the handle simply clears over the surface completely. Cleaning out a deep mortise with a chisel is fairly impossible but tradesmen everywhere still do it. They would be better off with this model which is square and thick in cross section but has an unusual curved side profile designed to lever the wood fibres from the base of the mortise. If you do a lot of second fix work involving doors then this one is for you. The sash mortise is a heavy pattern originally intended for making up window sashes, as the name suggests, and has a striking hoop. 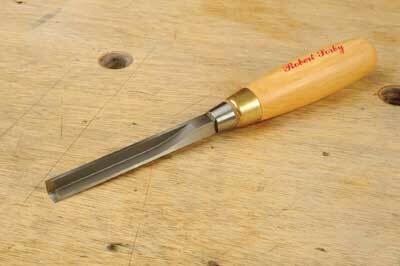 Mortise chisels have a very thick square section profile designed for levering wood from the mortise, resisting the force of bending where more lightly built chisels could be damaged under the load. There are also variants referred to as 'registered' or 'framing' which also have striking hoops at the top. To suit today's construction needs there are chisels created using modern design and manufacturing materials to make tools that will take a lot of abuse on site and keep sharp for longer. Brands such as IRWIN are typical exponents of this modern trend. We could write a whole article on Japanese chisels but they tend to be expensive and require their own special care regime to keep them fit to use. 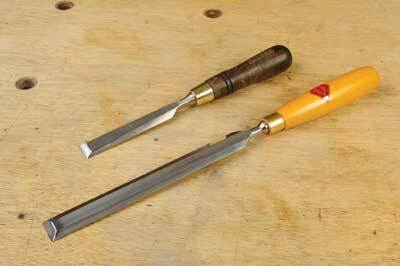 They look a bit like western chisels but the body metal is slightly soft - a relative term for tool steel! - while a thin layer of really hardened steel is laminated to the body metal by hand forging. This is hot, hard difficult work but it gives a wickedly hard and sharp cutting edge if you follow the correct sharpening method using the supplied instructions. There are times when flat won't do because a curved surface is needed. 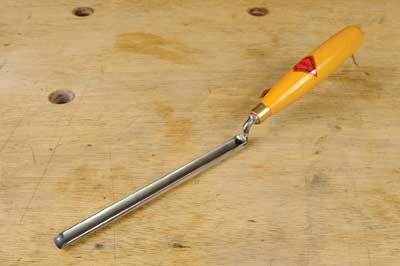 The answer is to use a suitable gouge. These come in different radii and overall widths. 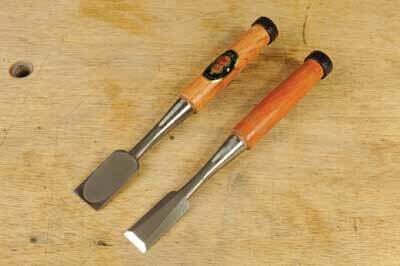 You may be able to press a carving gouge into use if it has a straight blade body as these do. 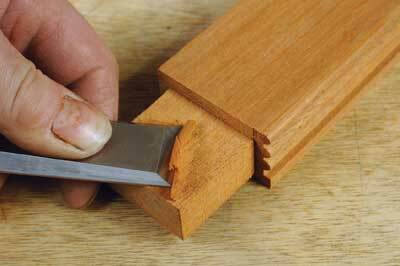 In-cannel -Â channel - means the bevel is on the inside, so the cut made at the outside edge producing waste to the inside. This version cuts on the inside edge and produces waste on the outside of the cut. 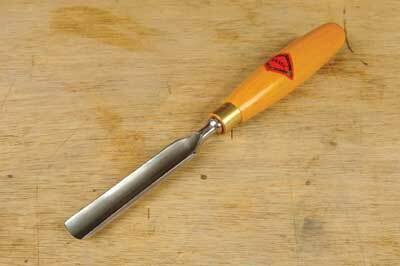 Both patterns create a crisp incised shape allowing you to remove the waste away from the line neatly using a chisel. An extended version of the above types, with a cranked neck or straight for when you need deep access such as for forming flutes. You only need a few gouges as a rule. Experience will show what is most needed but a couple each of 'in and out' cannel gouges in both wide, larger radii and narrow, smaller radii sizes should do. The sharpening regime is similar to plane blades i.e. the coarse grinding angle is 25° and the honing angle is 30°. 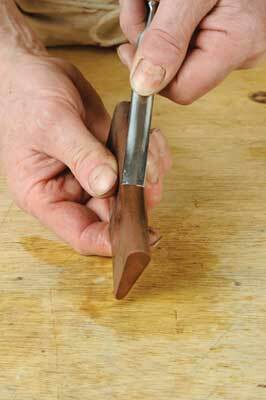 To grind a badly worn blade a wetstone grinder is ideal but most of us can't afford one. A standard dry grinder is okay but the stone needs to be in good order and you need to keep a water bath handy for cooling. If you can adjust the rest on the grinder so much the better, otherwise hold the blade at what appears to be the correct angle and check with a sliding bevel. 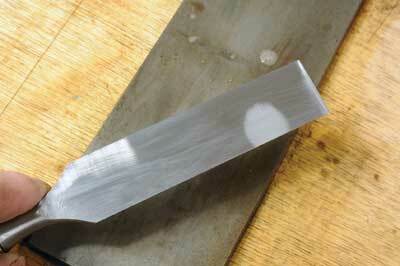 Grind evenly across the upper face and keep dipping the blade in water for several seconds. 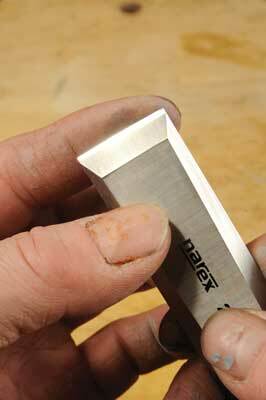 Failure to do this will cause the blade edge to colour with the heat. By the time this happens it will be too late and the metal will have 'lost its temper', this is evident by the metal going from light straw through dark straw, blue then purple and finally a flat blue-grey colour. You will get a hollow grind on the bevel which may be a bit severe, sliding it up and down the wheel slightly will help flatten it a bit which will hold the strength of the edge metal. 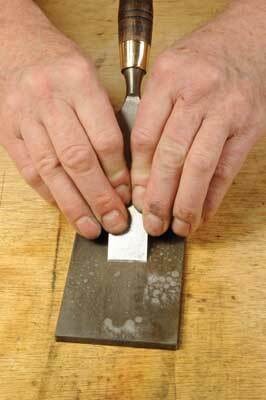 Having got a coarse grind, honing the secondary micro bevel is done with a honing guide on a sharpening stone. 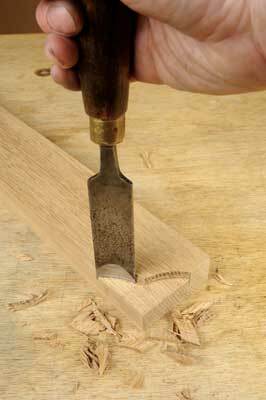 The first time you use a chisel it is worth getting the back as flat as possible. Just as I do with my planes, I start with a 600 grit diamond plate and water or lapping fluid, the latter has reduced surface tension so it sticks to the plate and won't cause any rusting. Start by flatting the the back to level it and remove any grinding burr. Now hone the micro bevel on the top face. Standard honing guides are often marked with the correct blade projection so you can set them up with ease. Next it's time to use a 1,000 mesh ceramic stone taking care not to score it with the narrower blades. Repeat the process as before with the diamond plate. Lastly, I use a block of 'end grain' MDF all stuck together in strips, with abrasive paste to polish the cutting edge to a very fine finish. The result is a razor sharp edge that will give the best result with the least effort. These are a different matter because of the blade curvature. 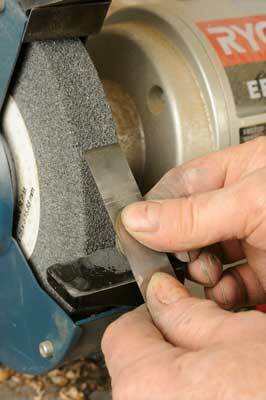 Grinding entails rolling the tool sideways against the abrasive wheel so you achieve a smooth curve. 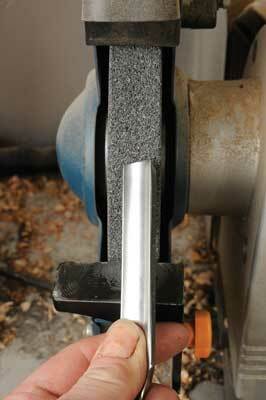 An in-cannel gouge will require a narrow round-edged grinding wheel and some care to get a good result. 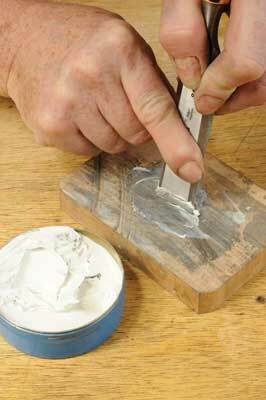 Honing on internal bevels requires either a slipstone or a multi-profile waterstone. External surfaces can be honed on a flat plate or stone, again with a rolling action. Edge polishing with abrasive paste is quite important for a really clean cutting action. 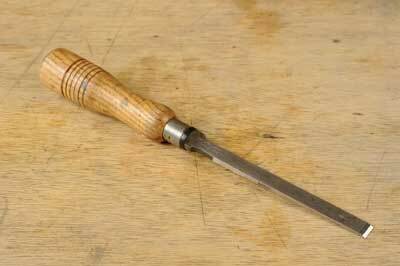 1 Stating the obvious, chisels can be very sharp and therefore dangerous. However, if you need excessive force to chop a mortise or struggle to pare a tenon face cleanly, then it just isn't sharp enough. 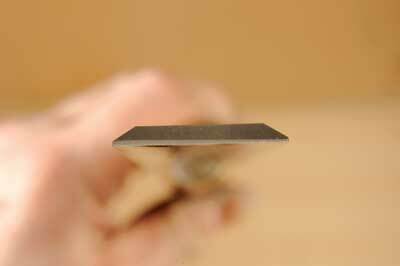 Refine your sharpening technique so you can get razor sharp cutting edges for cleaner easier cuts. 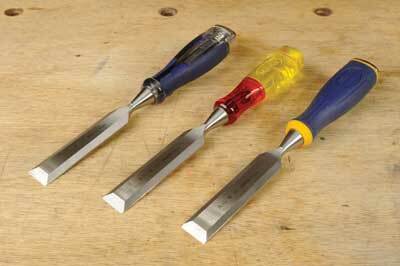 2 Have two sets of chisels, one for best and one for site work which is much rougher. Spend a bit more money on the best set so you can own ones to be proud of, the site set can be much more heavily built and not pretty! The best steel will retain its edge longer especially at a very shallow honing angle. 3 Unless you are chopping using a mallet or hammer, you should always have one hand guiding the blade with the other pushing the tool forward. It not only gives proper control but prevents the possibility of a user having a hand dangerously placed in front of the blade; clamp the work instead. 4 On site, chisels are always going to get clouted with a hammer, but wherever you are a mallet is far better. The conventional flat-faced mallet has a larger face area to avoid misses but will get dented with use. 5 Best of all, a round mallet should be used, the reason being that a flat hitting face can slide off the chisel handle, with a hammer this can be particularly painful and concentrated force can damage a handle. A round bronze or lignum vitae mallet head will almost certainly strike despite the curvature and won't dent easily. 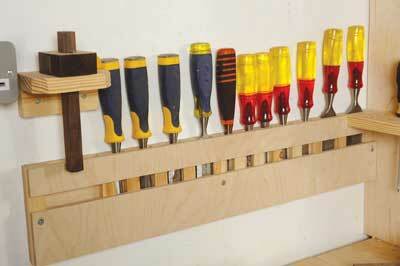 6 Keep your workshop chisels in a safe rack to protect the cutting edges and any stray hands that bare edges could slash. My favourite pattern of rack has been seen before but bears repetition. 7 Working on site, chisel guards or sheaths or a leather tool roll are essential for safety and edge keeping. A smaller 600 grit diamond plate and lubricant is all you need for 'site sharpness' as the demands are less critical than in fine benchwork. 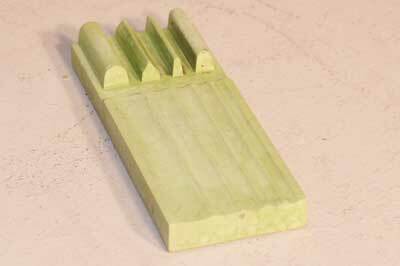 8 If you are serious about dovetail joints you need to pick chisels that have a sharp enough bevel edge to fit the undercut profile of a dovetail. 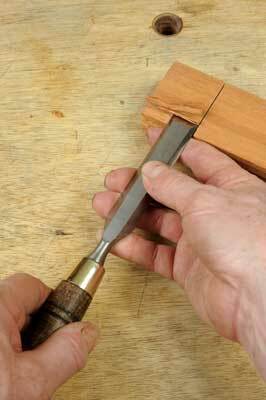 9 You can create flutes or beads with gouges but you may only want to 'cut a line' with a gouge so you can then chisel up to it, achieving a very crisp shape. 10 Lastly, always keep your tools clean and rust-free. I use very light camellia oil and wipe down the blade to the tip thus avoiding an accident. It is worth investing in a rust inhibitor compound that you can leave in the toolbox or tool drawer. Typical chisel construction consists of a blank billet of specially formulated steel being drop forged in a blade shaped mould. The resulting shape with its surplus wings is then chopped to shape, ground to shape and heat treated. Tool steel is made to a specific hardness defined on the Rockwell scale and varies from one type to another. Blades have either a tang and leather shock pad and ferrule or socket - bolster - with or without ferrule to fit the handle to, although IRWIN use a rod shape instead. The process is highly automated for speed and consistency. The resultant blades are then fitted with handles which can be either wood with a ferrule to prevent splitting or a very tough plastic which is moulded into place. 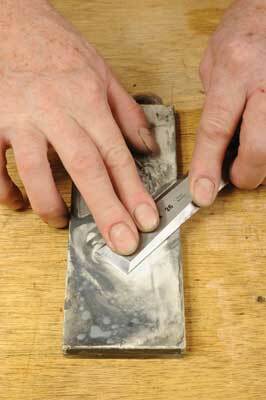 After this it is down to you to choose which chisel type and to maintain it.